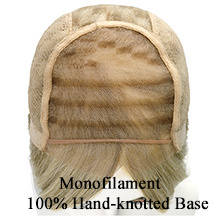 This cap features monofilament in the top area and a 100% hand tied base, resulting in the most natural looking hair movement for the entire wig and the versatility of amazing off-the-face styling. In (Figure #2) are three examples of a monofilament top. (Figure # 2).. The Venice, Boston, and Remy Mono Long. s you can see from the Boston (the middle wig), even shorter wigs look natural. 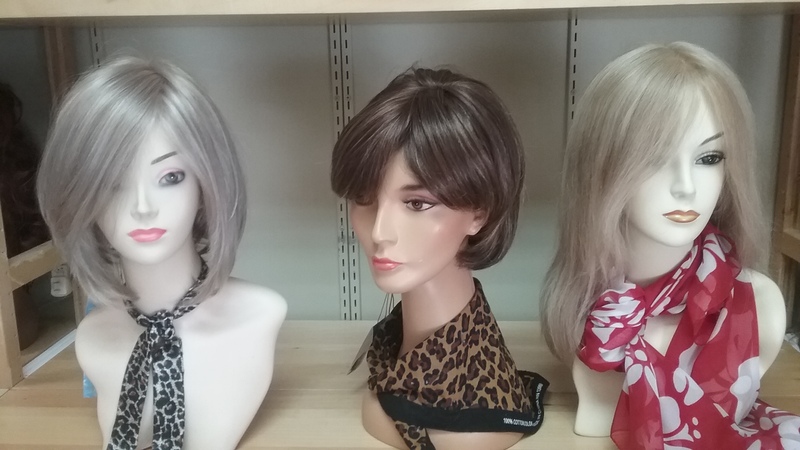 What a Monofilament does, is it adheres to the color of your scalp to show a natural scalp not even your family or friends will know you have a wig on.The mannequin we chose,is darker so you can see the part and you can see the color. One the Venice (left) and the Remy long(Right), we chose lighter mannequins (almost white in color) so you can see that the cap is versatile and adheres to a different color naturally. Natural no matter what , it is designed to mimic your natural scalp.